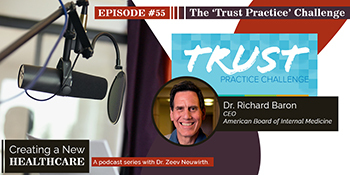 CEO Richard Baron discusses the “trust issue” in health care and the goals of the Trust Practice Challenge on the “Creating a New Healthcare” podcast. Trust is essential to effective health care, and research has shown that the quality of health outcomes depends on a stable foundation of trusting relationships. Yet trust in health care has been in steady decline in the United States over the past several decades. endorsement of clinicians during care transitions. Through this initiative, we hope to assemble a compendium of replicable and scalable practices that have helped build or rebuild trust in various aspects of the health care system. why you believe it can be replicated. between patients and health systems/hospitals. An independent expert panel of clinicians, academics and C-suite leaders in health care will review the submissions and select eight winners. Entries will be evaluated on innovation, evidence that the practice builds trust, and potential for scalability. Challenge winners will receive a full stipend to attend and present their practices at the 2019 ABIM Foundation Forum, a select annual gathering of nationally recognized thought leaders in health care practice and delivery, academic medicine, research, journal publication and philanthropy. Read about the 2018 ABIM Foundation Forum. The Forum also will provide winners with opportunities to meet and network with a diverse audience of more than 100 well-known influencers in health care. In addition, the winning submissions will be highlighted on the ABIM Foundation’s website and through other communication channels. All entrants will become members of a community of interest, a group of proponents who have thought seriously about the issue of trust in health care and want to take steps to drive change. The ABIM Foundation will connect, support and activate this community by enhancing communication among thought leaders and creating opportunities for shared learning. For further information, please contact Wanda Odom, Director of Communications, at wodom@abim.org.